SOLD! Thank you -Vintage Alaskan Inuit Eskimo craft hand built scale model dog sled. Exceptional detail and proportions very possibly a patent model. These sleds with the "wheelbarrow" style driving handles as opposed to a looped driving bar seem to be indigenous to parts of Alaska and present day Canada where they have been made for thousands of years. 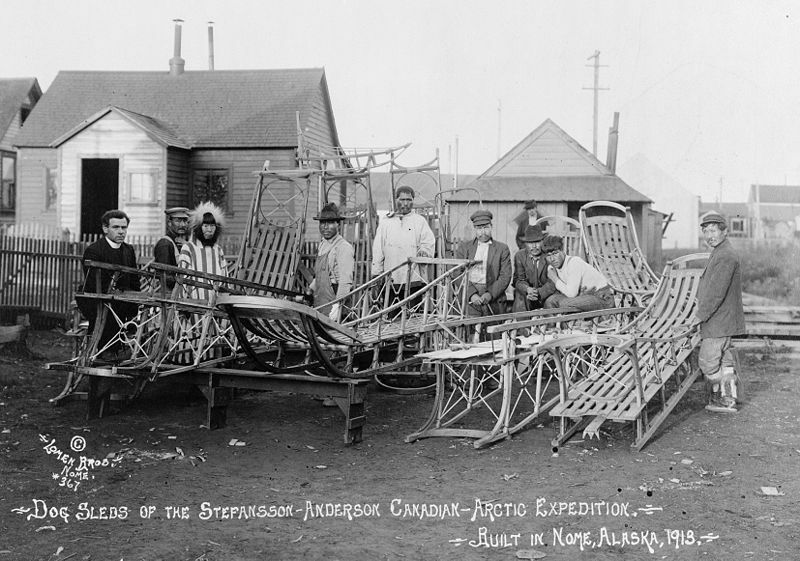 Do see the photo of the sleds being made in the early teens for the Stefansson-Anderson Arctic expedition of 1913. Large model at 24" long, hard to tell exact age but due to the the crazed varnish I would say 30's or 40's. This was purchased from an advanced collection of Inuit crafts and baskets.